On Monday, October 8th, we'll be creating an Abundance Grid together! While we are on this topic, I want to share with you some other common grids and which crystals you could use for each type. This will help you grow your crystal collection in a practical way... helping you make sure you end up with stones that really work well for your unique purposes, as well as knowing which stones can be utilized for more than one purpose. •Protection: Black tourmaline, onyx, amethyst, selenite. Love and Abundance are probably the two most commonly used grids. If you'd like to try a Love Grid next, check out Tracy's Love Grid Kit here. The types of grids you use are totally dependent upon what you're wanting to create in your life. This list combines Erin and Tracy's research, knowledge, intuition and experience. It's what works for us. But remember, you are the creator of your reality, so there is no right or wrong in how you use Crystal Grids to help you manifest. 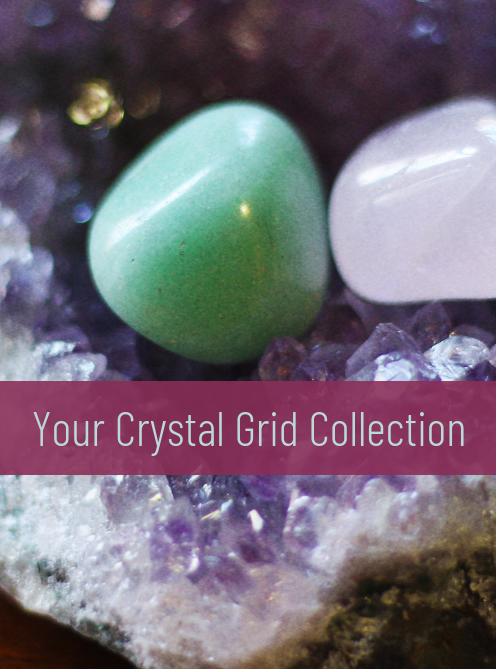 If you have a Topic you want to create a grid for, you can research crystals or use this guide, but you can also use your intuition to guide you towards which ones are right for you and your unique situation.